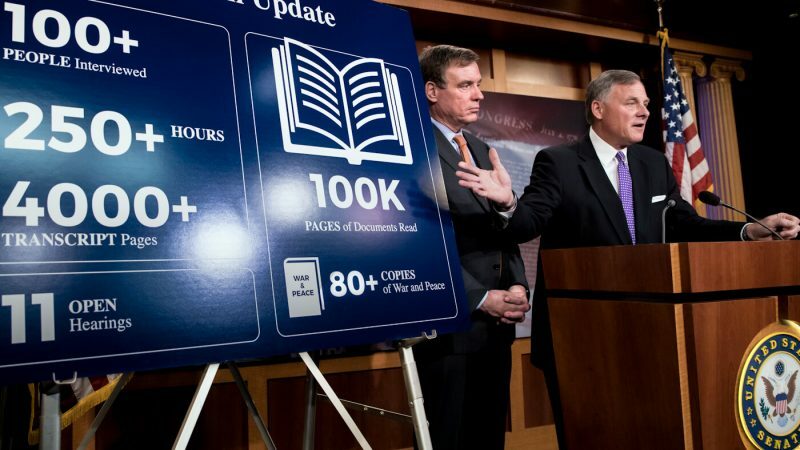 On December 17, two reports detailing ongoing Russian interference operations commissioned by the Senate Intelligence Committee were made public. They generated a week’s worth of headlines and sent members of Congress and cable news pundits into a Cold War frenzy. According to the report, everything from the Green Party’s Jill Stein toInstagram to Pokemon Go to the African American population had been used and confused by the deceptive Facebook pages of a private Russian troll farm called the Internet Research Agency. Nevermind that 56% of the troll farm’s pages appeared after the election, that 25% of them were seen by no one, or that their miniscule online presence paled in comparison to the millions of dollars spent on social media by the two major presidential campaigns and their supporters to sway voters. This was an act of war that demanded immediate government action. 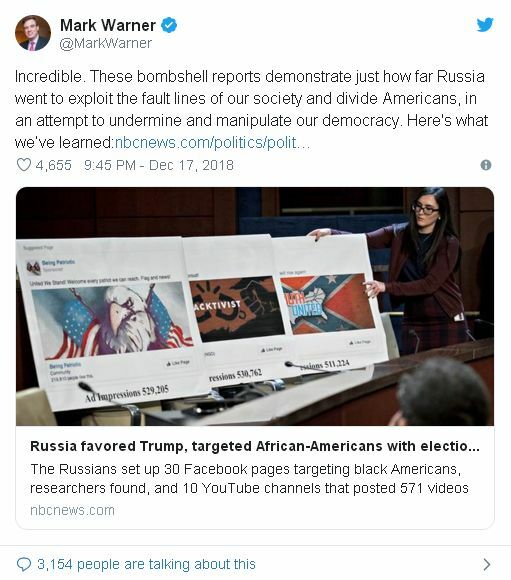 According to Sen. Mark Warner, the Democratic chair of the Senate Intelligence Committee, the reports were “a wake up call” and a “bombshell” that was certain to bring “long-overdue guardrails when it comes to social media”. Morgan began his career as a product manager at AOL before founding a series of start ups, some with funding from the United States Agency for International Development and Silicon Valley billionaire Pierre Omidyar’s Omidyar Network. Morgan also developed technology for the Defense Advanced Research Projects Agency (DARPA), the arm of the Department of Defense created for basic, applied technological research, and futuristic war toys. 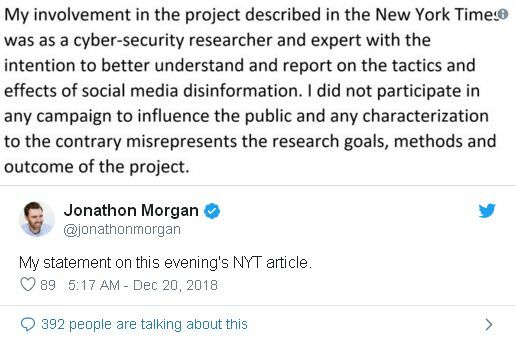 Rising through the ranks of the national security apparatus, Morgan ultimately emerged as a go-to source for credulous reporters seeking to blame Hillary Clinton’s loss to Donald Trump on Russian disinformation. 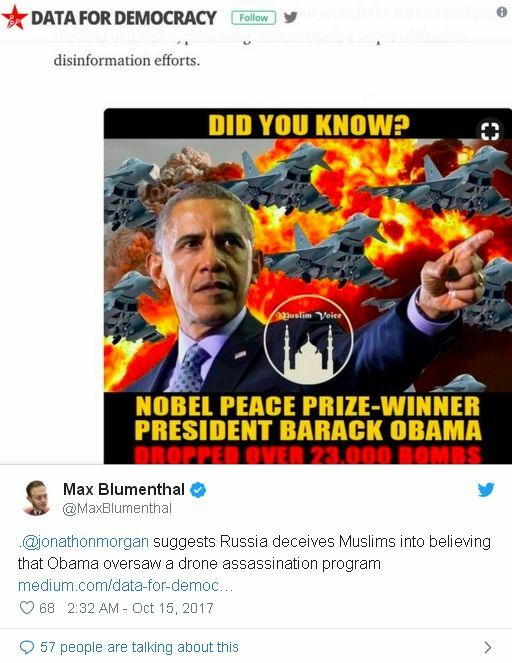 In an interview with the local CBS affiliate in Austin, Texas, Morgan told viewers that feelings of discontent were telltale signs that they had been duped by Russian disinformation. “If it makes you feel too angry or really provokes that type of almost tribal response, then it may be designed to manipulate you… People should be concerned about things that encourage them to change their behavior,” he warned. Fox, for his part, is a 15-year veteran of the National Security Agency and was a computer analyst for the Joint Special Operations Command (JSOC) military unit. JSOC is notorious for its spree of atrocities across the Middle East including digging their bullets out of dead pregnant women’s bodies in Afghanistan. Comparatively little information is available about Fox’s background. 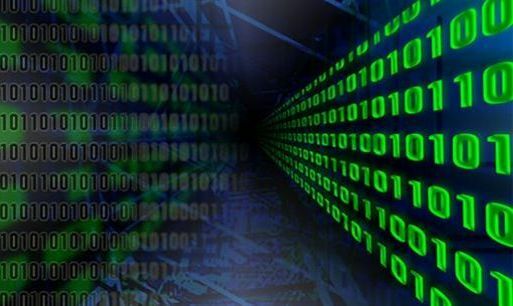 Since receiving an $11 million investment from venture capital firm, GGV Capital, in August 2017, New Knowledge has positioned itself as one of the leading private intelligence firms taking on the scourge of Russian disinformation. The outfit made its biggest splash on December 17th when it published one of the two Senate Intelligence Committee-commissioned reports. The report, titled “The Tactics and Tropes of the Internet Research Agency,” was oversseen by Renee DiResta, a former Wall Street trader and tech specialist who was recruited by Obama’s State Department to devise strategies for combating online ISIS propaganda. The hobby lobby of online obsessives converged at New Knowledge this year to sound the alarm on supposed Russian disinformation. In a New York Times op-ed published as Americans went to cast their votes in the midterm elections, Morgan and Fox alleged that the Kremlin was secretly running hundreds of propaganda websites in an effort to swing the outcomes. That assertion ran counter to the narrative the two operatives had been spinning out just months before. In an interview earlier in the year, Ryan Fox suggested that despite the Trump administration’s multiple rounds of sanctions against Russia, Vladimir Putin was so satisfied with the state of U.S. affairs that the Kremlin had actually cut back on its supposed interference. 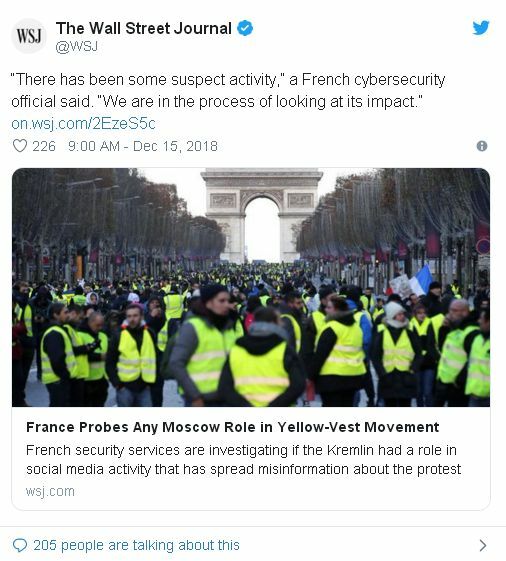 More recently, Fox claimed to have identified hundreds of Russian-controlled Facebook and Twitter accounts active in France’s Yellow Vest movement, which has raged against the country’s neoliberal leadership and sparked anxiety among centrist elites across the Atlantic. However, Fox produced no evidence to support his incendiary accusation, prompting reporters to qualify his assertions as “very likely” and write that he merely “believes” Russian interference took place. Morgan is also one the developers of the Hamilton 68 dashboard, an online project dedicated to inflaming public outrage over online Russian bots. Funded by the German Marshall Fund’s Alliance for Securing Democracy – which is itself backed by NATO and USAID – Hamilton 68 claims to track hundreds of accounts supposedly linked to Russian influence operations. The effort has largely succeeded in drawing positive media attention despite one of its founders, Clint Watts, admitting that the Twitter accounts it follows may actually be real people who are not Russian at all. Because Morgan and his colleagues have explicitly refused to name the accounts monitored by Hamilton 68, his claims can never be proven. It may have been that New Knowledge had no knowledge at all of Kremlin botnets, but their reports were nonetheless treated as gospel by droves of credulous reporters eager to make their name in the frenzied atmosphere of Russiagate. 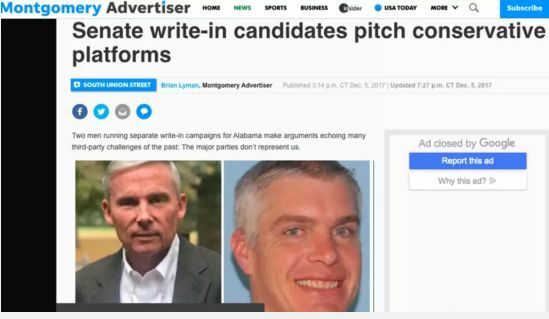 According to an internal New Knowledge report first seen by the New York Times, the firm carried out a multi-faceted influence operation designed to undermine a 2017 bid by right-wing Republican former state supreme court judge Roy Moore for an open Alabama senate seat. By its own admission, New Knowledge’s campaign capitalized on the the sexual assault allegations against Moore to “enrage and energize Democrats” and “depress turnout” among Republicans. To accomplish this, the New Knowledge team created a Facebook page aimed at appealing to conservative Alabamians by encouraging them to endorse an obscure patio supply salesman-turned-write-in candidate named Mac Watson. They hoped the subterfuge would peel votes away from Moore. It was precisely the kind of tactic that New Knowledge claims Russian troll farms carry out to sow divisions among the American electorate. Morgan told the New York Times the effort stopped there. But the New Knowledge report says the Facebook page “boosted” Watson’s campaign and even arranged interviews for him with The Montgomery Advertiser and the Washington Post. At the same time, Watson’s Twitter following mysteriously jumped from 100 to about 10,000. Of the dozens of conservative Alabamian Facebook pages the Watson campaign messaged, the New Knowledge-run page was the only one that responded to it. “You are in a particularly interesting position and from what we have read of your politics, we would be inclined to endorse you”, they wrote. New Knowledge then sought to manufacture a link between Roy Moore’s campaign and the Kremlin by claiming thousands of his Twitter followers were Russian bots. Mainstream media outlets credulously ran with the narrative, insinuating that the Christian theocrat Moore was secretly backed by Russia. The Montgomery Observer first reported the alleged link:Russian invasion? 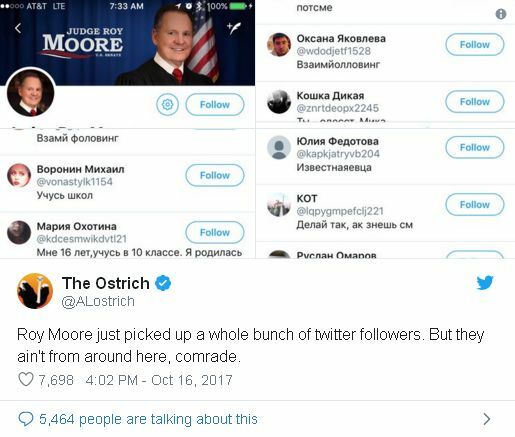 Roy Moore sees spike in Twitter followers from land of Putin. From there, it was picked up by Mother Jones, whose headline read: Russian Propagandists Are Pushing for Roy Moore to Win. But there was no proof of any Russian connection to the accounts. To bolster its evidence-free claim, Mother Jones simply turned to Hamilton 68, the highly suspect Russian influence monitoring system that Morgan helped design. 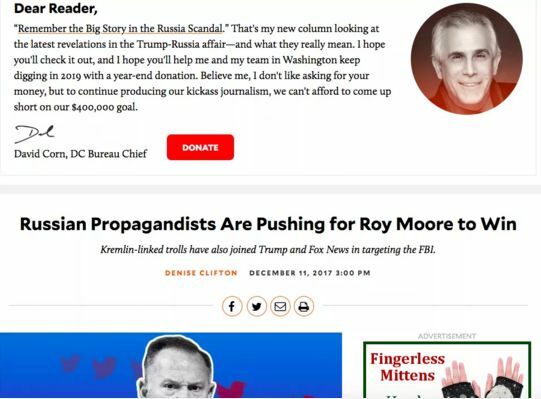 Today, as can be seen below, Mother Jones is using a bogus story generated by a disinformation campaign to raise funds for more Russiagate coverage. Moore’s opponent, Jones, said he had no knowledge of the operation. Moore was roundly mocked in liberal circles as a conspiratorial crank, but New Knowledge’s internal report contained a stunning admission: “We orchestrated an elaborate ‘false flag’ operation that planted the idea that the Moore campaign was amplified on social media by a Russian botnet,” its authors revealed. While the New York Times says the internal report does not confirm that New Knowledge purchased the bot account themselves, the accounts’ flagrant use of Cyrillic language and profile pictures of famous singers including Britney Spears, Christina Aguilera and Avril Lavigne strongly suggest that whoever bought them went to extreme lengths to leave the appearance of a Russian hand. The Alabama disinformation campaign was carried out through a network of Silicon Valley tech entrepreneurs and former Obama administration officials who have joined the private sector to leverage liberal anti-Trump outrage into profits. Billionaire Reid Hoffman, who co-founded the employment networking site LinkedIn, provided $100,000 for the black ops campaign. The money was then pipelined through American Engagement Technologies, which is headed by Mikey Dickerson, a former Google engineer who founded the United State Digital Service. Since the New York Times’ exposé, Facebook released a statement announcing its suspension of “five accounts run by a multiple individuals for engaging in coordinated inauthentic behavior,” including Morgan’s account. The social media platform has opened an investigation, though it has not revealed what the other pages are or who operated them. For his part, Sen. Jones has demanded an investigation. “I think we’ve all focused too much on just the Russians and not picked up on the fact that some nefarious groups, whether they’re right or left, could take those same playbooks and start interfering with the elections for their own benefit,” he said. While the impact of the disinformation campaign on the Alabama senate race may never be quantified, the cynicism behind it is hard to understate. A group of Democratic Party operatives with close ties to the national security state waged a cynical campaign of online deception against the American public, while marketing themselves as the guardians against from foreign interference. Few, if any, Russian hackers could have done as much damage to the already worn fabric of American democracy as they have.